GSMArena team, 13 January, 2016. Before we begin, we should note that aside from the three phablet stars of the today's show, we're also having a guest appearance by the Meizu PRO 5 as a fourth camera in this comparison. It won't take part in the official ranking, but we wanted to use it as a reference as it has the same size screen and its camera wowed us back when we reviewed it. The Huawei Nexus 6P uses a sensor optimized for low-light performance, which has fewer pixels than the competition. Even so it has the widest camera, which allows it to capture more of the scene, but will hurt the fine detail (fewer pixels for more of the scene). The LG V10 and Samsung Galaxy Note5 both have wide-screen cameras and both have the same field of view. They squeeze in less vertically but as much as the Nexus horizontally. The Meizu PRO 5 has a 4:3 camera with a FoV in between the Nexus and the other two. The weather wasn't perfect, but the Nexus 6P turned in a gloomier picture than necessary. It underexposed the shadows, but managed to keep most of the sky from overexposing. The Meizu PRO 5 managed to render the sky well, but without harming the shadows, which suggests a wider dynamic range or some clever processing. The Samsung and LG both let the sky overexpose to save the shadows. Color rendering tends towards a warm yellow except on the Nexus, which leaned towards a cooler blue (this makes the picture even gloomier). The Meizu turned up the saturation, while the others were more restrained and closer to the real scene. 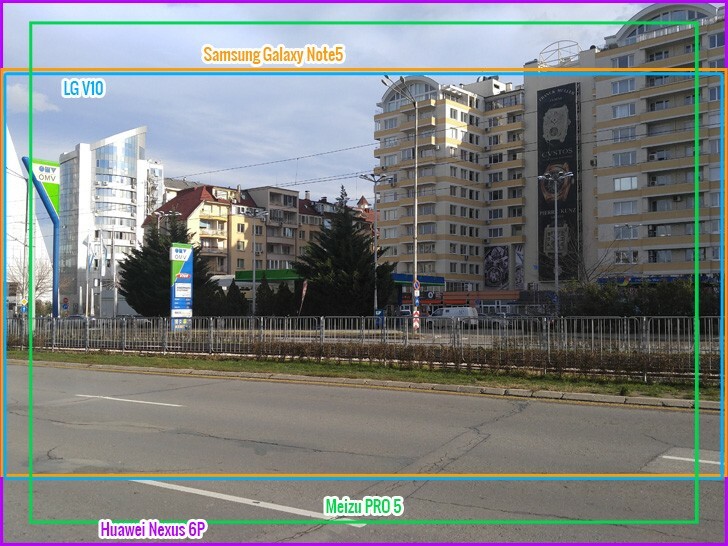 All four phones produce impressive photos, rich in detail and with little image defects. The LG V10 noise reduction creates some unevenness in solid colors and the sharpening creates a stair step effect. Again, these are only noticeable at pixel level. The Samsung Galaxy Note5 does less sharpening but thanks to better noise handling there's slightly more detail in its photos than the LG. When comparing their images at pixel level, we can tell the Note 5's photo appears softer (due to the more hands-off image processing). The Huawei Nexus 6P is a little starved for resolution, in part because it needs to offset the wider field of view. The per-pixel quality is excellent, which keeps the photos competitive even when you examine them up close. The Meizu PRO 5 has the most resolution to play with and it puts it to good use. Foliage and other intricate detail are rendered faithfully without relying on strong sharpening. The colors are slightly off the mark though. Winner: LG V10. It makes full use of its 16MP sensor, with sharp images, which are rich in detail. Colors are accurate, but there are some signs of noise. Runner-up: Samsung Galaxy Note5. 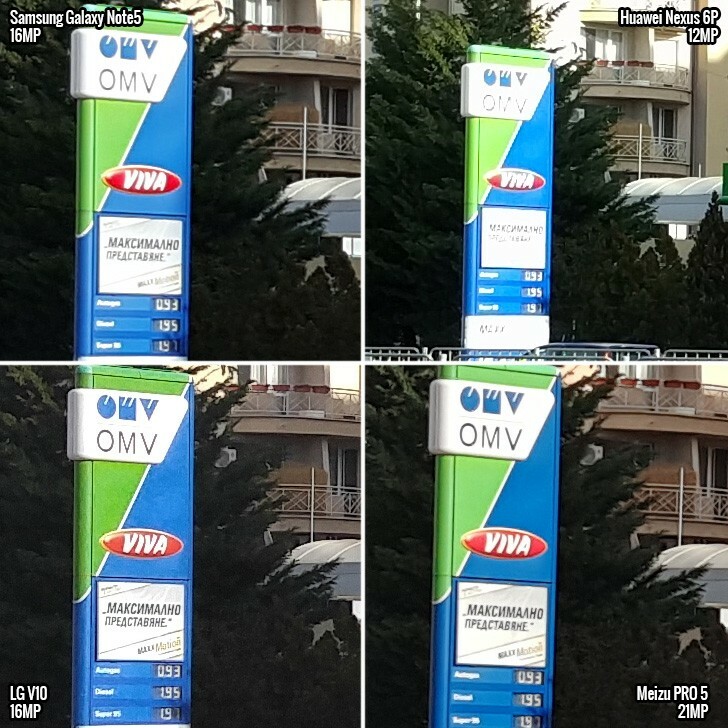 While the photos are not quite as sharp as those on the V10, you may not notice until you view them at 1:1 pixel level on your screen. Third place: Huawei Nexus 6P. This is an exemplary 12MP camera, but the other two have 4 extra megapixels and it shows when you get up-close. The Huawei Nexus 6P has an 8MP selfie cam while the others have 5MP shooters and the selfies produced by it are easily the best of the bunch. It's not only due to the higher sensor resolution. We just love the way the image was processed, the nicely blurred background detail, the great, natural-looking detail on our subject's face and the overall dynamic range. Surprisingly, it's the Meizu PRO 5 that came closest to the Nexus is quality. Both produce sharp images with plenty of detail and little noise. The LG V10 does fairly well, though noise reduction tends to smudge fine detail like facial hair. Note that we used the narrow 80° camera for this test as it was closest in field-of-view to the others. The V10 also offers a wide 120° selfie camera. The noise reduction was particularly strong in Samsung Galaxy Note5 shots and preserved the least amount of detail in our subject's face. Winner: Huawei Nexus 6P. The 8MP camera is excellent and the Nexus produced the best-quality selfies of the bunch. Runner-up: LG V10. The duo of cameras is a great idea and the quality is fairly good, though noise reduction hampers its performance a bit. Third place: Samsung Galaxy Note5. 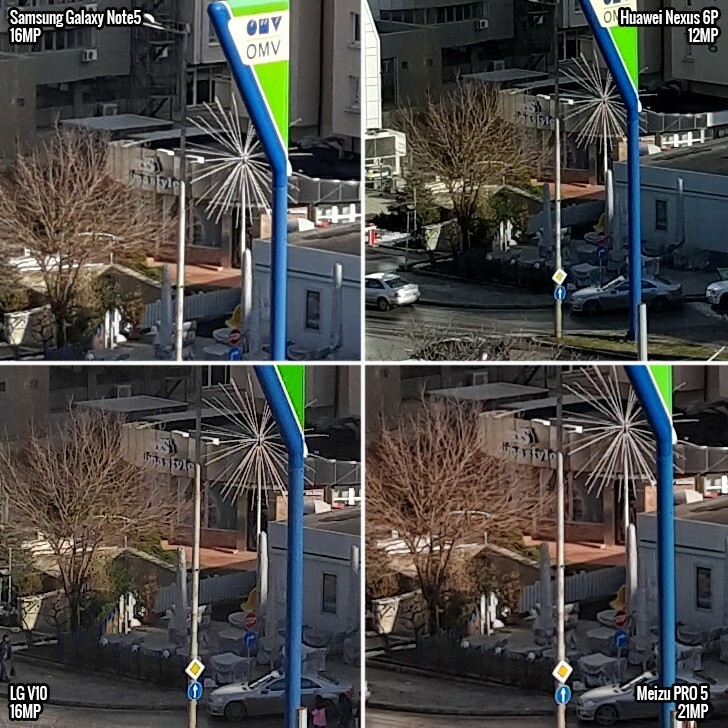 Strong noise reduction has negative impact on image quality.